Crazy right now there. Runway still closed. I hope they bring these thugs to justice. easyJet have cancelled their flights for the rest of the day now. Note that LNER are accepting passengers on flights to Scotland for free from King's Cross, and TSGN are offering pretty much full flexibility on services to/from Gatwick. Am now hearing talk of some IT problems at LHR causing significant delays too. Thanks. I thought it would work here since it’s not BA specific. Mods feel free to close. The BA forum thread is has developed so now is not really BA specific, and so off topic for BA forum. But off topic threads in BA forum are not unusual. Silver Fox and nancypants like this. I wonder how soon someone will fly drones into LHR airspace to close down one of the world's busiest airports. I would imagine that the reaction by law enforcement would be much swifter if it were to happen again. Obviously, you may have a day of disruption but bad weather (high winds/snows) tends to do that as well. When things like this that are easy to 'copy cat' happen, there usually are copy cats. As I see it, whoever is doing this has now just handed anyone who wants it, an easy way to disrupt a country. It is not just the cancelled flights, it is all the domino affects that it results in as well. I see the couple they had arrested have now been cleared and let go. So the perpetrator is still at large. One idea that apparently falls into the 'sounds good if you say it fast enough' category was training eagles to down the drones. As for swift action by law enforcement, I think that is another 'sounds good if you say it fast enough' response. There is no doubt they would want to act swiftly but just how realistic is that? Anyone can stand anywhere up to 2 kilometres from a runway and control a drone. How realistic is it that you will catch them easily? If they do it often enough, yes, eventually they will get caught but it doesn't really take a whole lot of smarts to be circumspect about it. 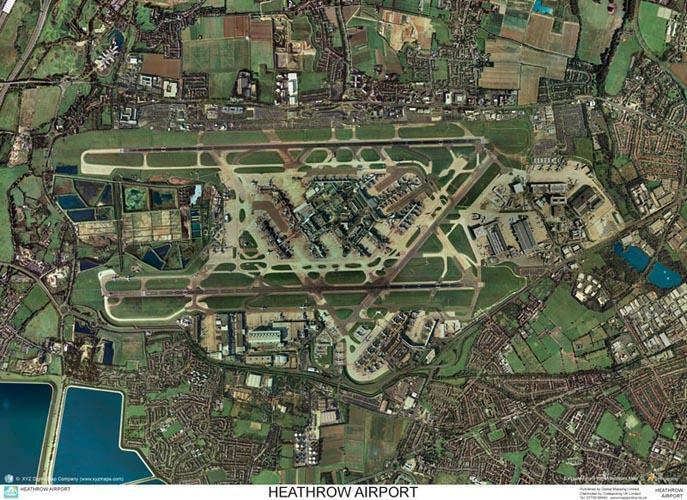 Take a look at an aerial view of Heathrow and where nearby someone might fly a drone from. It isn't as if the airport stands in the middle of an entirely empty area where a person flying a drone could be easily seen. Has there been any update on this? A week ago the word "chaos" was used about every 3 minutes from all the UK news anchors. I'm back in the States now and wonder if any conclusion came about. The last I heard was late in the week that it might have been a crane's lights and not a drone at all. Still no conclusion although some reports in the media today suggest that some of the drone sightings may have been of the police drone sent up to investigate. A light on a crane would likely have been static or if it was operating have a very restricted field of moving and limited working hours and easily discounted as the cause. And of course the airport authorities would have been aware of construction in the vicinity. I know some people have scoffed about the police drones but if they were legitimately used to try and track the other drones down the public could very well have reported those as drone spottings and of course the cycle then continues.